This week the people’s choice for colour was hot pink and orange – two colours I love. 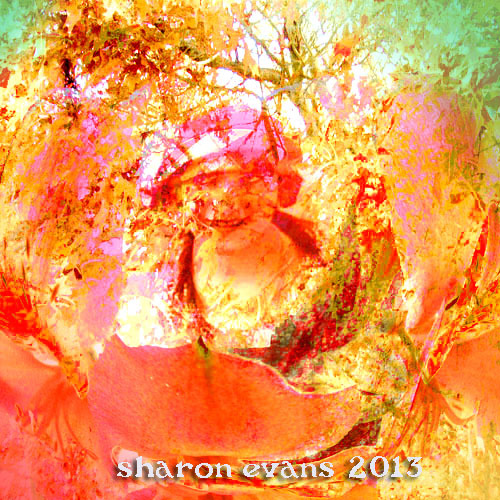 I have completed two pieces this week one a small painting and a digital piece. This second piece was one I started before my shoulder operation. We have had a glorious autumn with some amazing colours. This last week or so we have slipped into a horrible wintry weather pattern, grey and more grey, so having to work in these bright colours brings back summer. The trees are from photos I took on a walk about 6 weeks ago and the girl I got from Free Digital Vintage Photos. Why not check out some wonder work by other participants on the Summer of Color that Kirstin is hosting on her blog. Even better why not join in. You can see my work also on my photo stream or click on to the Color of Summer’sphoto stream at Flickr. Just beautiful work and poetry! These are amazing, Sharon! I could never paint like that! Beautiful artwork!!. She is just gorgeous!. I love the digital collage, hope one day I'd be brave enough to try it too :). 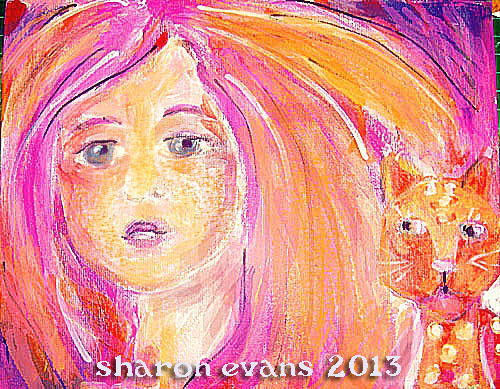 I really like this painting of the girl with her cat - great style! I love, love, love the first painting. It is stunning. On the second one the colours seem to explode, really gorgeous! Hi Sharon. You've combined the two colors so well. Love this. It's going to be summer over here on the 21st. Enjoy winter though. :) Great work. Wow, that first painting is absolutely gorgeous. Love the verse that inspired it too. Love the effects on the digital image too. Beautifully done. Oh this is so beautiful as always I love how you project color onto a page!! Great verse too! Your first Girl and the poem is so beautiful ! Your seccond one looks magic and wild - this touched me. I love the small painting! The colors look beautiful and the lovely girl and the cute cat match perfectly! My favourite is the first piece with the little cat peeping in. Lovely Sharon! I love them both - your painting is precious. I love both of these, and i love the verse you picked to paint the girl with, too. Your art is so fabulous and creative! I am in awe!!!! Wow your paintings are stunning! Love the orange and pink. Love both the works.The colors are so brilliant in the second one. I love your lady. I seldom add words to my art because I think it takes away from the beauty of the piece. I'm sure yours would work either way. As I sit here drenched in perspiration, I feel for your freezing weather conditions and grey skies. I like them both, but I think my favourite is your painting. I love the face, and love the exptression on the face of the little cat, too! I love both pieces, very creative! What great pieces.... I especially love the second one! Has definitely been very gray in the last few days. We had sun today which was most welcome. I love both the girl and your digital image. A fabulous use of the colour prompts. So richly layered and textured.